Dreams became reality after Callum Hudson-Odoi made his senior England debut against the Czech Republic, setting a historic record in the meantime. Chelsea's young prodigy became the Three Lions' youngest debutant in a competitive international during their European Championship qualifier, originally held by Duncan Edwards back in 1955. Whilst only 18 years and 135 days old, Hudson-Odoi demonstrated maturity beyond his age during his brief spell as England ran away 5-0 victors. He replaced hat-trick hero Raheem Sterling with 20 minutes remaining, causing the already shattered Czech Republic defenders another reason to despair. Hudson-Odoi was also joined by fellow teenager Jadon Sancho underneath the Wembley arch, both looking to be the figures of the nations bright future. Therefore, it was the first time in 138 years that England featured two players aged 18 or younger in an international match, back in February 1881 against Wales. "I didn't think it was real"
Having been summoned from the U21 squad by Gareth Southgate into his senior side, plenty of hype and speculation swirled around the Blues winger about the part he might play on Friday evening. Albeit a cameo, Hudson-Odoi highlighted why he is so held in such high regard, showing no fear against experienced professionals. "I couldn't believe it (when I was told to get ready)", said the youngster to Sky Sports. "I didn't think it was real. I was looking around the crowd and everybody looked happy - I couldn't believe it. "I didn't know what to do, but I was delighted, and hopefully there'll be many more to come." England's next fixture is away against Montenegro and with key players missing, Hudson-Odoi's second cap may just be around the corner. "I want to thank everybody for helping me get here, and to get the opportunity to play today is a massive feeling in front of the home crowd as well. Hopefully, there's many more to come." Not starting a Premier League game Chelsea hasn't hampered Hudson-Odoi's confidence as indicated against the Czech's, clearly with a point to prove to his club. A former Chelsea starlet was first to pay tribute to the teenagers terrific talent. "He's so direct," said Joe Cole on ITV after the match. "When he comes on for Chelsea in European games, every time he gets it he's driving at players. He's got beautiful balance, he can go both ways." Mark Pougatch was also quick to add, "Every single time he got on the ball he only had one thing on his mind." "At the moment he's prepared to take risks. If it doesn't happen, he'll get it and try again." In the European fixtures Cole touched upon, Hudson-Odoi has come into his element; he has four goals and two assists in his eight Europa League matches this season. This has given him an edge over many of the emerging talents across the game, despite a lack of minutes compared to his peers. Pougatch didn't see this as an obstacle for Hudson-Odoi however, saying on ITV, "It doesn't matter what age you're, I don't care how little experience you have, because Hudson-Odoi has very little experience." "You're good enough if you can prove it." 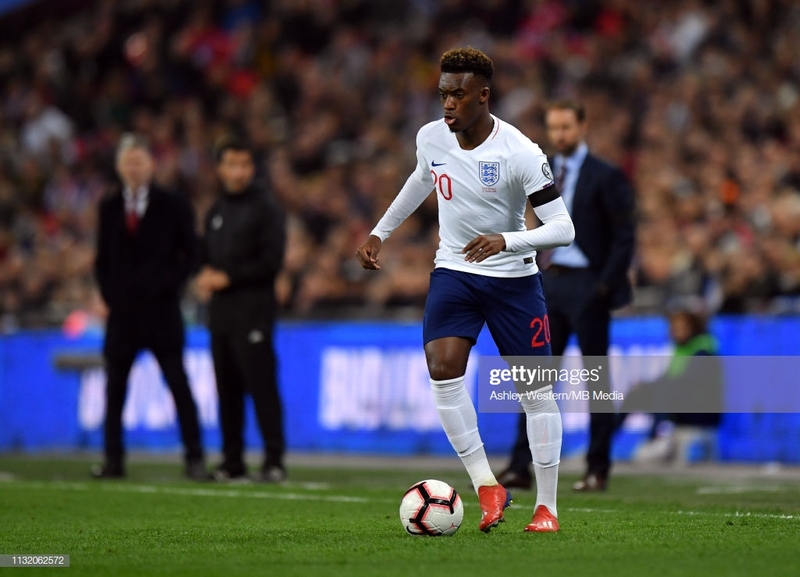 There is still a long journey ahead in terms of his development, but Hudson-Odoi has handed Southgate a fine weapon in his ever-growing armoury that he'll hope can continue to fire on all cylinders.